SWITCHWARE® – a globally recognized electronic payment system designed to manage, process and route ATM, ITM and POS debit transactions, as well interface to a core banking system, an EFT network and manage a bank’s EMV-enabled debit cards. The system’s latest G4 version allows for a web-based front end module used for ATM monitoring to deliver a graphically-intuitive display with a command-level view of the entire ATM network. Real-time icon statuses show the activity of each ATM as it is happening. It includes a robust card-issuing module with open account relationships that can link one or more accounts with one or more card records. Multiple BINs and institutions may be arranged for logical groupings that correlate to the FI’s requirements for issuance. A comprehensive card limits and authorization rules module provides control over withdrawals and authorizations. Additionally, cardholder transaction research, settlement, and dispute resolution are all achievable from a single system. ● jXchange Middleware – The Jack Henry third-party gateway which utilizes a Windows-based .NET web SOAP interface to access all Jack Henry systems. It was originally designed for interfacing with third party systems, such as check imaging, internet banking, loan systems, etc., and each SOAP session requires user authentication with special SOAP handling logic. jXchange also requires the customer to have a separate server and individual interfaces for each connection to the core. Lastly, this approach is not recommended for high-volume or high-performance customers who need to process several transactions a second. ● MEALink – Offered by MEA Financial, the AS/400 middleware solution provides a direct interface to the iSeries JHA core system (both Silverlake and CIF 20/20). This option is a more streamlined approach, achieving the highest throughput and performance possible for memo posting a debit transaction to the Jack Henry core. ● The use of a standard financial interface – No longer using an HTTP SOAP interface designed for third-party processing (internet-banking, check-imaging, etc.). Jack Henry controls the way in which third-parties access their solution using SOAP. SOAP has a considerable amount of bloatware (code that has lots of unnecessary rules and controls that inhibit performance). ● Streamlined support – The number of organizations and groups involved to implement new changes or troubleshoot issues is greatly reduced. The “time to resolution” for support tickets and issues is shortened considerably using this method. ● Direct access to JHA core systems – Not having to rely on multiple layers of solutions (points of failure) to get access to the Silverlake or CIF 20/20 core system. 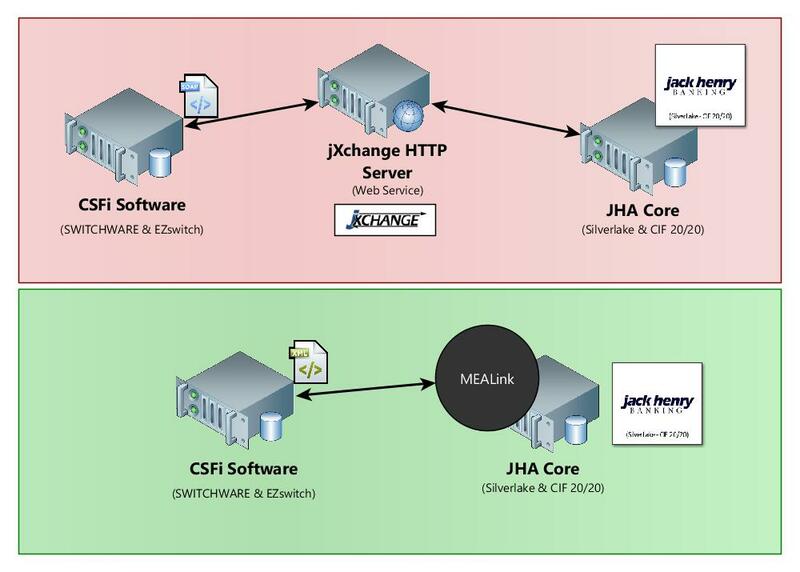 ● Higher performance and throughput – Using MEA middleware will allow CSFi solutions to pump financial transactions to the core at an exponentially higher rate than could ever be possible with jXchange. Virtually no limitation to any amount of transaction volume. ● MEA installs directly on AS/400 – No need to purchase other server equipment, and no other system or server has to sit between SWITCHWARE and the JHA core system. ● Better integration for desired enhancements – Setting up future solutions, like card maintenance, or PIN Change at the ITM/ATM can be handled in a more expeditious manner, and would require very little (if no) involvement from Jack Henry. ● Tight integration with MEA and CSFi ancillary solutions – Using the variety of MEA Financial and CSFi products, the suite of solutions are coupled to offer features such as allowing the cardholder to temporarily disable the debit-card from a mobile system, or allow cardholders to increase their card limits from the internet banking or mobile system, where those changes can flow to SWITCHWARE in real-time.